The Best meal I had in Japan was also the last meal I had before my departure and the most expensive one also – making it triply-memorable. Save the best for the last, they always say. It was somewhere along the bustling streets of Shinjuku that I stumbled upon this quaint little shabu shabu joint that had my edacious taste buds lingering behind. Perhaps it was not so much of the food, rather the combination of chilly weather, nightfall, racing against time, grumbling tummies, wagyu, wagyu, wagyu and well – being in Japan. You’d probably start yawning by now, but please hold the chopsticks, as we are just about to embark on one indulgent feast of shabu-shabu – a reminisce of the past, I shall call it. I can never say no to beef balls. I gave it a little puff before slowly biting through it, not knowing that steaming hot soup is about to ooze-out almost immediately. My tongue got a little burn there but was glad to see vegetable fillings inside! Halfway through our meal, grey clouds started forming and it began to drizzle. Before we knew it, rain started to pour, heavily. Hell yeah Mother nature, you just made my meal a much more blissful one! Everyone knows that steamboat is best eaten on rainy days right? Now, moving on to the meats – I love the meats. Those delicately rolled meat slices – beef, chicken, pork, dori fish, lamb, abalone, venison (deer). 7 types of meat slices and unlimited refills by the way. As far as I know, this is the most variety offered by a Shabu Shabu joint. My pick: the beef, pork and abalone slices. I wasn’t huge on the sauces but 798 had an array of special sauces on display. Albeit having 8 types of it, I kept going back to the Thai S2 chilli sauce only, personal preference nonetheless. Not too fond of the desserts on display also. 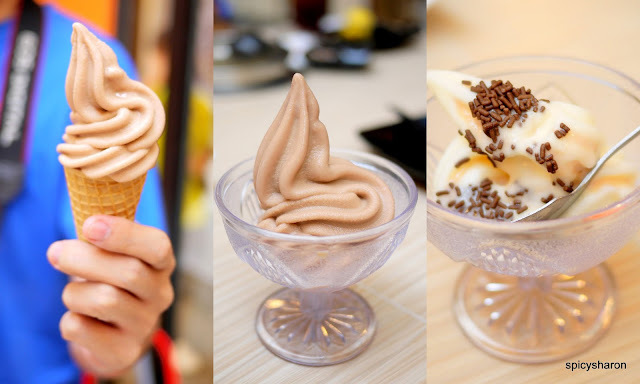 3 types of ice cream which texture was far from being like ice cream and a sad looking plate of fruits. Needless to say, my sweet-buds was not satisfied at all. On a side note, have I ever mentioned that I really – I mean, really really enjoy the sight of a busy table, heavily laden with plates of delicious food, along with the camaraderie and laughter of the people occupying it? Oh, yes I do. Overall Rating: 6.5/10. There’s not much nay about this place nor much yay, seriously. Comparing with the other well known favourite, Sukiya, I figured 798’s soup base needed a little booster, as well as the meagre dessert choices. Apart from that, I thought the idea of having a self-pot was fantastic and the array of meats and seafood selection was decently satisfying also. As far as I know, 798 is one of the only shabu shabu restaurant that serves as much as 7 meat choices. Located at Oasis Boulevard and right opposite Xia Mian Guan.